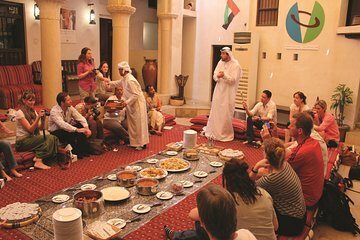 Discover traditional Emirati culture and art on a 4-hour tour of old Dubai, with a local guide. See the mud-brick wind towers and courtyards of Al Bastakiya and Al Fahidi, visit boutique art galleries, and admire the beautiful Diwan Mosque. Savor Arabic coffee and fresh dates during a fascinating interactive question and answer session about Emirati life and culture; see Deira’s glittering Gold Souk, and explore women’s role in Emirati life and art at Dubai’s Women’s Museum. Numbers are limited to 15 for a small-group experience. Start with a hotel pickup and travel into Dubai’s Al Bastakiya quarter, the city’s oldest residential district, to learn about its roots as a simple fishing village and trading port. Hop out of your air-conditioned vehicle and see the mud-brick wind tower houses and courtyards that characterize the area. Visit some local art galleries that showcase Emirati and international art and culture, such as the Majlis Gallery and XVA Art Gallery Hotel. View the colorful art and crafts on show, and soak up the traditional courtyard settings that recall the area's Persian mercantile heritage. Continue to the Sheikh Mohammed Centre for Cultural Understanding, and enjoy a walking tour around the Al Fahidi historic district. Delve into the narrow lanes and hear about the area’s Persian-inspired wind towers — designed to capture and direct cool breezes down into the buildings’ interiors. Head inside the beautiful Diwan Mosque to admire its Islamic calligraphy and plays on Fatimid architecture, and then return to the Sheikh Mohammed Centre for a fascinating question and answer session. Take a seat and enjoy some reviving Arabic tea, coffee and dates as you ask local experts anything you wish about Emirati life, architecture and culture. Afterward, travel to the bustling Gold Souk in Deira. See the glittering gold, silver and jewelry outlets crammed into the maze-like lanes, and pay a visit to the nearby Women’s Museum. Admire the art, exhibits and multimedia displays, and learn how women have helped to shape Emirati society, culture and arts down the centuries. After around four hours’ exploring, your tour concludes with a drop-off back at your hotel.